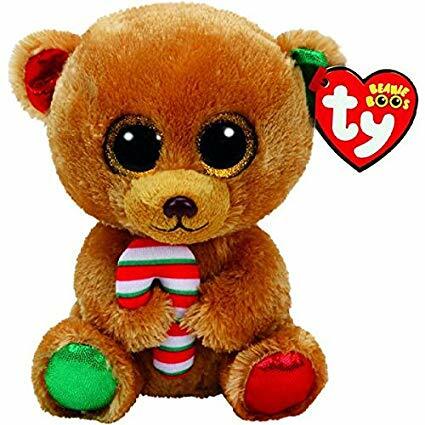 Bella is a fuzzy brown bear with large, glittery gold button eyes and a black button nose with a black embroidered mouth. Her left ear and right foot are shiny green and her right ear and left foot are shiny red. She carries a large red, green and white striped candy cane in her paws. And then I play with toy trains! Bella was released in June 2017. Her Birthday is on 5th December. There are four versions of Bella. This is the extra large 12″ version. A small 6″ Beanie Boo, a medium 9″ variation and a key clip also exist.